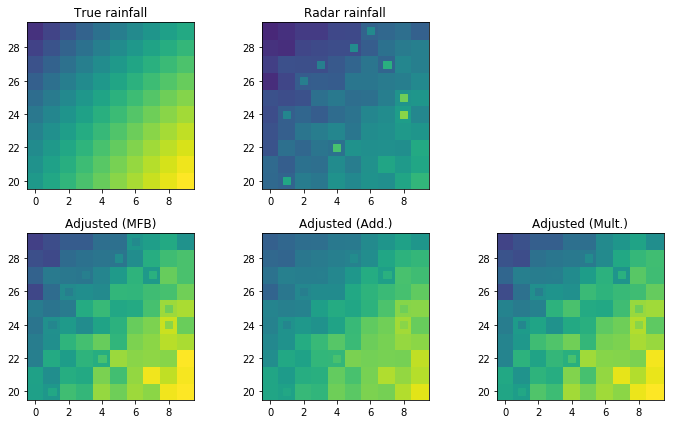 There are various ways to correct specific errors and artifacts in radar-based quantitative precipitation estimates (radar QPE). Alternatively, you might want to correct your radar QPE regardless of the error source - by using ground truth, or, more specifically, rain gauge observations. 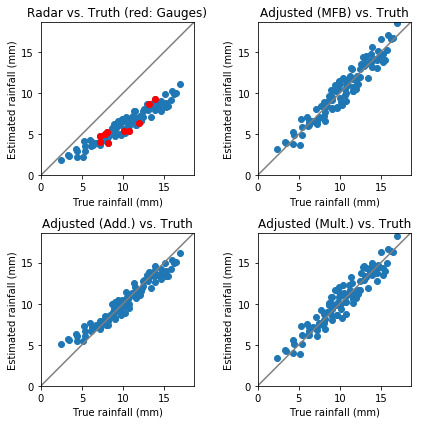 Basically, you define the error of your radar QPE at a rain gauge location by the discrepancy between rain gauge observation (considered as “the truth”) and radar QPE at that very location. Whether you consider this “discrepancy” as an additive or multiplicative error is somehow arbitrary - typically, it’s a mix of both. If you quantify this error at various locations (i.e. rain gauges), you can go ahead and construct correction fields for your radar QPE. 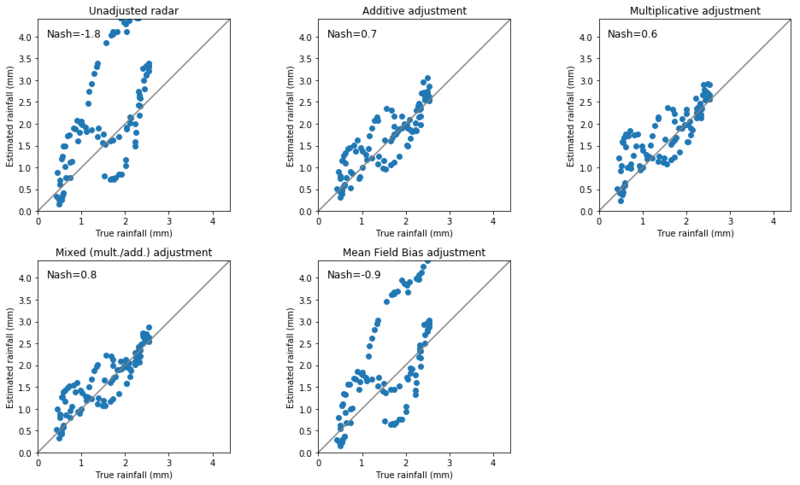 You might compute a single correction factor for your entire radar domain (which would e.g. make sense in case of hardware miscalibration), or you might want to compute a spatially variable correction field. This typically implies to interpolate the error in space. 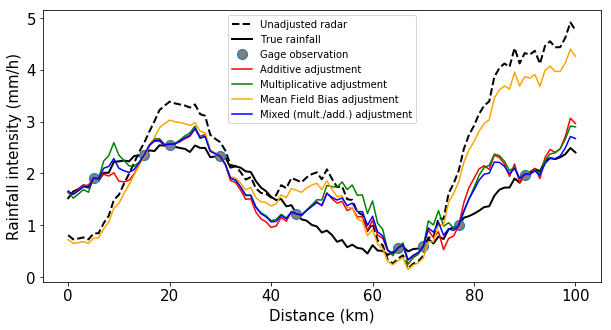 \(\omega radlib\) provides different error models and different spatial interpolation methods to address the adjustment problem. For details, please refer to \(\omega radlib's\) library reference. Looking at the 1-D (instead of 2-D) case is more illustrative. First, we create synthetic data: - true rainfall, - point observations of the truth, - radar observations of the truth. The latter is disturbed by some kind of error, e.g. a combination between systemtic and random error. /home/travis/miniconda/envs/wradlib/lib/python3.6/site-packages/numpy/core/fromnumeric.py:688: UserWarning: Warning: 'partition' will ignore the 'mask' of the MaskedArray. We use the verify module to compare the errors of different adjustment approaches. Here, we compare the adjustment to the “truth”. In practice, we would carry out a cross validation. The way these synthetic data are created is totally arbitrary - it’s just to show how the methods are applied. radar[radar < 0.] = 0. /home/travis/miniconda/envs/wradlib/lib/python3.6/site-packages/wradlib-1.1.0-py3.6.egg/wradlib/adjust.py:628: FutureWarning: `rcond` parameter will change to the default of machine precision times ``max(M, N)`` where M and N are the input matrix dimensions. To use the future default and silence this warning we advise to pass `rcond=None`, to keep using the old, explicitly pass `rcond=-1`.